Snug as a bug in a rug, or a sweet babe in a swaddle. 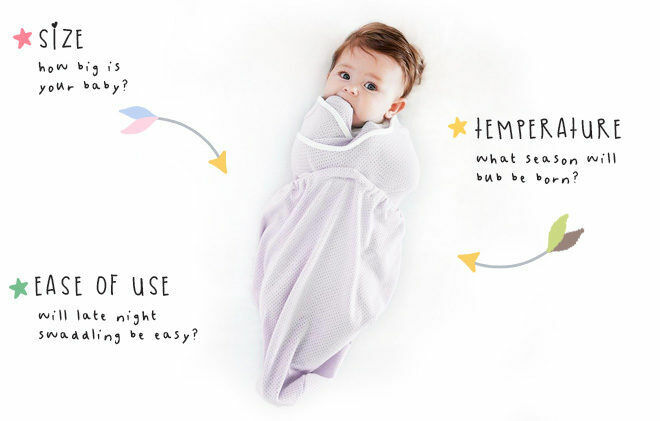 A swaddle can be you and your fresh bub’s sleep saviour and create a strong link to the bedtime routine. But which type of swaddle will suit? 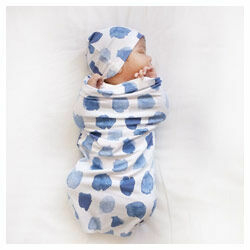 There are a host of different types of swaddles but the basic principles are all the same. The aim is to restrict movement of the arms to prevent bubba waking themselves with their startle reflex. You’ll need to consider the season your little one will be born in, what room they’ll be sleeping in and if you’ll be using swaddling for naps or nighttime or both. As with everything baby, there are always choices, choices, choices. But not to worry, we have done the work for you and below is all the info you need to know about choosing the right swaddle for you and your baby. Before you decide what to buy, you need to know what you can buy and why. We’ve answered some basic questions for you to get your head around what’s out there and what you might need. 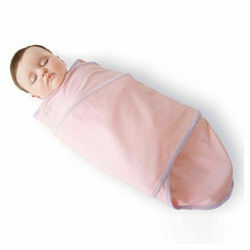 Swaddle wraps are the traditional way of swaddling your baby with either a muslin wrap or blanket. Wraps are one-size-fits-all and can also be used in other ways, like a breastfeeding or pram cover. 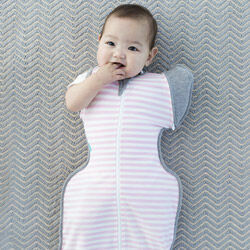 Zip swaddles are sack-style suits with zips that make it easy to put bub in and difficult for them to get out. Usually, they come with a two-way zip for easy nappy changes. Somewhere in between a wrap and a zip suit, there are a range of pouches that involve some basic wrapping and often secured by velcro. Transition swaddles start with both arms in, then either one or both arms come out for transitioning from the swaddle into a sleeping bag. Swaddling is all about making babies feel safe and reduce their startle reflex so they can settle and sleep peacefully. The decisions for you are all about what where you live and how your baby likes to sleep. You’ll need to consider the size of your bub at birth, how quickly they grow and how soon you’ll be transitioning from a swaddle to sleeping bag. Wraps and blankets: come in a range of sizes 80x80cm, 120x120cm, 150x150cm and everything in between depending on the brand. 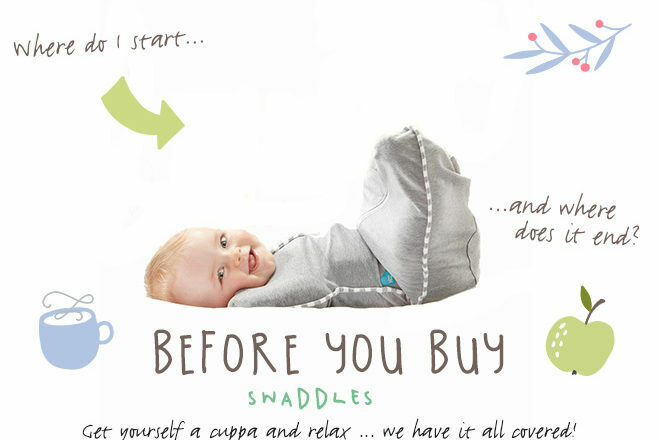 Swaddles and pouches: most brands group swaddles into weight sizes to suit newborns, three-month-olds, six-month-olds up to 12-month-olds. Longer swaddles and larger wraps will keep growing bubs snug for longer. Stop swaddling: Safe sleep guides recommend you to stop swaddling babies once they start showing signs of rolling – around the three months of age mark. Transitioning: Even though they are starting to roll, not all babies have outgrown the startle reflex and aren’t ready to move from ‘arms in’ to ‘arms out’. That’s where transitioning swaddles come in handy – they help babies move from a swaddle to a sleeping bag by letting one arm out at a time. Babies are unable to regulate their body temperature so it’s left to us to make sure they’re not too hot or too cold. And you definitely don’t want bub waking in the night because they’re cold! It doesn’t matter how hot or cold it is outside, it’s the temperature inside babies sleeping area the determines which swaddle to use. Heating and cooling: unless you’re running a thermostat 24/7 the room temperature will fluctuate during the day as well as dropping overnight. Room thermometers are handy to tell you the inside temperature. Muslin: Lightweight and stretchy, muslin is one of the most common fabrics used to make swaddles. It’s cool, so is perfect for summer. Cotton: Stretchy cotton can be used in any season at it’s a great breathable fabric. Merino: Prized for its ability to help regulate a baby’s temperature, merino is also very stretchy and great for all seasons. Flannelette: Just like flannelette sheets, this is best used in the colder months. < 1.0 TOG – room temperature 24 °C to 27 °C. 1.0 to 2.0 TOG – room temperature 21 °C to 23 °C. Generally the optimum temperature for a nursery is between 16-20°C and you’ll need to adjust the level of clothing your child wears within a sleeping bag depending on the TOG and room temperature. There are no Australian safety standards specifically for swaddles. However, there are safety recommendations for wrapping/swaddling babies, as well as products acknowledged as ‘hip healthy’ by the The International Hip Dysplasia Institute (IHDI). It has been found that incorrect swaddling may lead to hip dysplasia or developmental dysplasia of the hip. When in mum’s tummy, babies are in the foetal position so suddenly straightening their legs can lead to abnormal joint development. You want to be sure, whichever swaddle method you use allows room around the hips for movement. Avoid: straightening legs and restricting movement of legs and hips. If using a wrap, avoid wrapping tightly over the hips and legs. 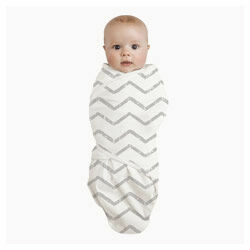 If purchasing a swaddle suit or pouch, ensure they allow plenty of hip and leg movement. Recommend: in order for swaddling to allow healthy hip development, the legs should be able to bend up and out at the hips. This position allows for natural development of the hip joints. Short on time? We’ve put together a collection of our favourites to suit every style and budget.